Will Passive Investing Fail and Doom Robo-Advisors? Is There a Dark Cloud Hanging Above a Passive Index Fund Investing Approach? Most, although not all, of the robo-advisors practice some form of a passive index fund investing approach. This means that instead of picking and choosing certain stocks and bonds for their investments they select funds that copy the investments of benchmarks. So, a robo-advisor offers an S&P 500 fund to it’s investors that owns stocks and bonds of the same 500 most important companies that are included in the unmanaged benchmark S&P 500 index. This type of passive index fund investing investing is based upon widely accepted and well researched investment practice that shows that it’s difficult for actively managed funds to invest and beat the major market indexes. Does that mean the robo-advisors are doomed? Notice in the chart below that investors are choosing to invest in index funds more often. In 200, only 9.5% of investors money was in index funds, and during the next 13 years that amount has almost doubled. Would Robo-Advisors be Doomed if Everyone Started Investing in Index Funds? How might this passive index fund investing phenomenon impact the robo-advisors – many of whom practice this approach – if everyone started investing in index funds, as opposed to actively managed investment funds? 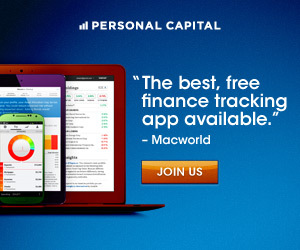 Would this mean that most robo-advisors are doomed? The argument that if everyone practiced an index fund investing approach then markets would cease to be efficient, has been around a long time. Back in the early 2000’s when I was in my MBA program this very conversation came up in an investing class. If this premise is true, and the majority of robo-advisors’ platforms are based on a passive index fund investing approach, then what might happen to the industry if the style started to fail? Will Robo-Advisors Fail Along With Index Funds? “Index funds will be permanent owners who can never sell. 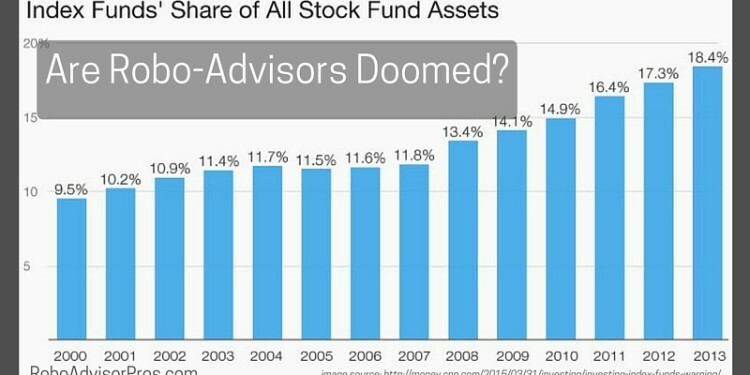 That will give them power they are not likely to use well.” ~from “A Billionaire’s Warning on Index Funds” by Jordan Wathen of the Motley Fool at CNN Money. Then there’s Mario Gabelli, legendary value investor who’s fund I owned for many years, who contends that index funds weaken corporate governance. He goes on to say that index funds typically don’t question corporate management’s activities which leads to governance that may not be in the best interests of the shareholders. To substantiate this allegation, it made the headlines in 2013 when a Vanguard index fund manager voted against directors at Hewlett Packard. From a purely statistical viewpoint, when everyone is buying the same stocks, it would be impossible for those stocks to outperform as there would be no counter party on the other side with which to trade and they would necessarily have to underperform. So does this mean that index funds are doomed to underperform and that the robo-advisory industry has jumped on to a sinking ship? We don’t think that robo-advisors are doomed or destined for failure. Despite their seeming expansive popularity, index funds represent less than 1 in every 5 investment dollars. There still exists thousands of actively managed mutual and exchange traded funds. Additionally, there’s no shortfall of investors looking to try their hand at stock-picking. You don’t need to look any further than the combined DIY/robo-advisory platform M1 Finance, to see the multitudes of folks that want to try their hand at stock selection. IFA went on to report that even if every professional investment manager went “index” there would remain other market participants buying and selling individual securities and making a market. These other investors would include corporations who buy back their own stock, companies that acquire other firms and thereby purchase their stock, corporate officers who buy their companies stock, as well as individual investors. It’s highly unlikely that ‘everyone will become a passive index fund investor’. Another chink in the ‘indexing will doom the market’ armor is this conundrum; If large company stock performance is mainly governed by passive investors buying index funds, without regard to the fundamental underpinnings of the company performance, then why did L Brands (LB), owner of women’s brands including Bath & Body Works and Victoria’s Secret lose 40.1% during the first four months of 2018? And if markets are all driven by indexing, then why did Netflix (NFLX) rise from $201.07 on January 3 to $329.60 on May 10 2018? 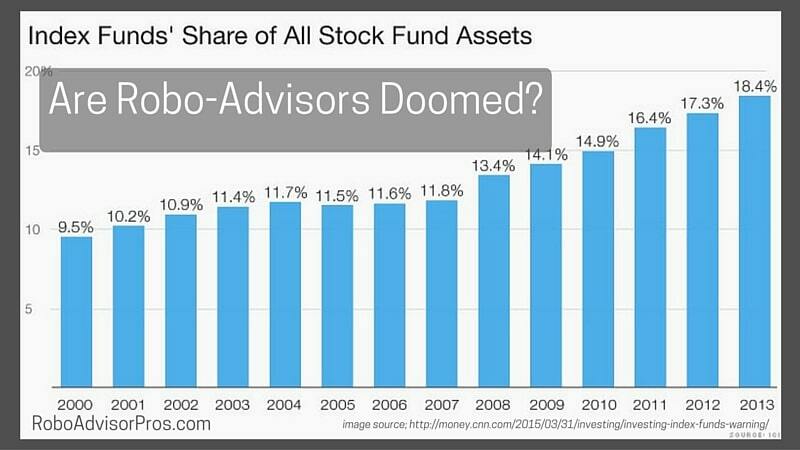 What Would Happen If Everyone Invested in Index Funds, Would Robo-Advisors be Doomed? Yet, we are at little risk of losing all active managers. In fact, qplum robo-advisor is an active robo-advisor that claims to protect against downside risk. And as long as there are active managers, index fund investing will remain viable. With lower costs and a long term history of beating actively managed funds, indexing isn’t at risk of losing the investing returns advantage. The argument against indexing has been around for a long time. Just because there are differing investing viewpoints, further suggests that a passive index fund investing approach won’t become ineffective any time soon. Thus, when considering whether the robo-advisory industry may be doomed to fail, you can likely rest assured that it’s not going to happen any time soon. After all, robo-advisors AUM (assets under management) is growing rapidly. Although that’s not to say that there won’t be some consolidation within the industry. Is Your Data Safe with a Robo-Advisor?